Employee advocacy is increasingly becoming an integral part of B2B marketers’ social media strategies, and for good reason. It is a cost-effective way to increase the reach of your posts and the visibility of your content. Your employees are a valuable asset you should be leveraging as part of your marketing efforts from the day they start working at your company (or even before they start). Employee advocates can help showcase your company culture, gain trust and credibility, and increase reach and visibility. Every department can participate and become social advocates; don’t limit yourself only to sales and marketing. It’s true that 72.6% of salespeople using social selling as part of their sales process outperformed their sales peers and exceeded quota 23% more often. However, you can also use employees to recruit new talent and promote your company’s culture. Every employee who uses social media has followers, and by sharing posts with these followers, you are opening up your brand to an audience you may not have reached otherwise. With every new employee brings the opportunity to make your brand known to more people and to expand your content reach. Employees are the most credible voices regarding the company’s work environment and integrity. Posts shared by employees create a level of trust to prospects and customers for your brand. Employee advocates bring the necessary human element to the brand. Salespeople and other employees may start the initial conversation that may eventually lead to conversion rates and sales. The experience with salespeople and employees, even on a social platform, greatly influences customer perception of a company. If a customer feels they are talking to a real person on social media rather than a marketing bot, they will have a positive experience and see the company really cares. The more frequently companies interact with customers, the more loyal customers become. Daily engagement builds advocacy 87% more, weekly engagement builds it 64% more, monthly engagement builds it 49% more, and a few times a year build loyalty 33% more. GoToMeeting, the virtual meeting application, believes in building credibility by featuring its employees and behind-the-scenes action on its Instagram account. The stories show the company’s dedication to its customers and its excitement for new trends in the technology industry. The photos, event shots, and videos are the perfect mix of marketing multimedia telling a narrative to engender loyalty and advocacy. Today, an employee advocate is trusted twice as much as a CEO. Customers no longer want to hear from CEOs promoting their own brand, but instead from the people who work at the company. If employees are happy, it is shown through their posts, and the brand becomes more trusted and credible. The voice of your employees is effective in giving authenticity to your posts. You want your brand to sound personable and advocates to show their individuality. It should not look like marketing is telling the advocates what to say, but that the employees are truly proud of the company’s work and information. It might sound simple, but the more advocates you have sharing and liking your posts, the more reach and visibility your social media accounts will receive. Brand messages reached 561% further when shared by employees versus the same messages shared via official brand social channels. Engagement and conversion levels are important factors to measure for your social media posts. With your new employees, make sure you are measuring your participation levels and the success of each department and teams. Your employees bring a wealth of connections when they join your company. Make it a point that, from the day they start, they are already updating their social accounts with the new job information. It was recently reported that 9 out of the top 10 brands with the most followers on LinkedIn have at least 60% of their employees on LinkedIn. You’ll already be reaching all of their connections as their friends and acquaintances see the new job update. However, make sure you provide employees with content relevant to them in order to keep them engaged with the program, which is easy to do through segmentation. Technology giant Dell knows the importance of fostering a community of employee advocates. As social media grew from a trend into a business necessity, the company trained over 15,000 employees on social media between 2010 and 2015. Their education includes learning to listen to social conversations, participate in these interactions, and advocate to customers. Now, employees implement their training into their jobs, technical support, and customer care. Your current employees should already be aware of the company culture and be advocating it through social posts. Therefore, visitors to your social pages should have a sense of your company values and culture through employee advocates currently at your company. When a candidate is evaluating your company to decide if they want to apply and work there, they will be more likely to be onboard with the company when seeing it as fun, collaborative environment. Developing that culture can recruit new candidates and also bring new prospects. In fact, 79% of job candidates are likely to use social media in their job search, with 86% using it in the first 10 years of their careers. One UPS recruiting campaign presented the job of delivery driver as being more than a day-to-day job. Their social media posts used images and the hashtag #WishesDelivered to show the spirit and humanity of what delivery drivers really do. The posts not only engaged customers with a sweet holiday message, but also garnered interest from prospective employees. Social media advocacy is also an important tool in how these prospective employees are recruited. They might seek you out first, but there is also the opposite situation, in which you find them. Social recruiting, especially on LinkedIn, has become one of the primary ways companies source, hire, and develop their workforces. A positive social reputation only attracts more candidates for the best possible options. If employees already know your culture, then you already have them on the right track to becoming social advocates. Employees of socially-engaged companies are 20% more likely to stay at their company. 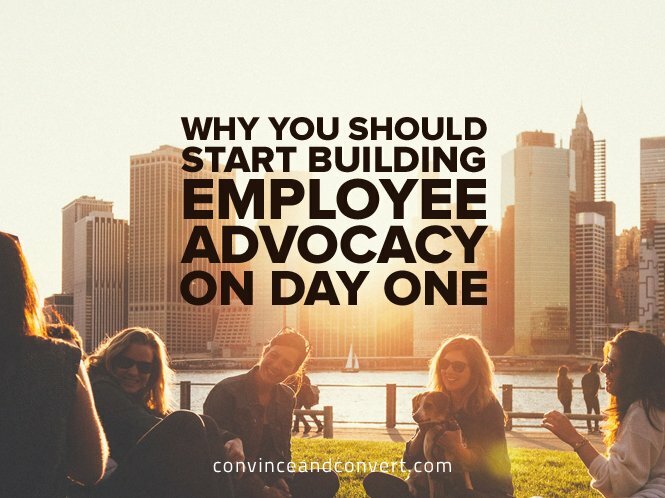 Social advocacy can also make employees feel welcome as they join the company. Other advocates, or the company itself, can welcome the employees on board through social media. You can also encourage socializing with other employees and getting involved with employee programs. If your new employees know the company’s values and missions, they are more likely to be proud of where they work, which will show through their social posts. However, be sure that your company has set social and brand guidelines in place, and be sure to give them to the new employees on day one. Getting your employees to become social advocates from the first day they start is an important way to increase engagement levels and conversions. Utilize the wealth of contacts your employees have and increase the reach of your posts. More importantly, if your employees are happy with the culture and willing to share their feelings on social media, employees are likely satisfied with their careers and will stay with your company longer.